This post is for anybody who works at home and finds that the boundary between dressing for work and dressing for bed has become very blurry. You can return to an office. Read on! Some time ago, I assured you that you could be as comfortable at the office in Business Casual as you are at home in pajamas. See Soft Pants v. Hard Pants. 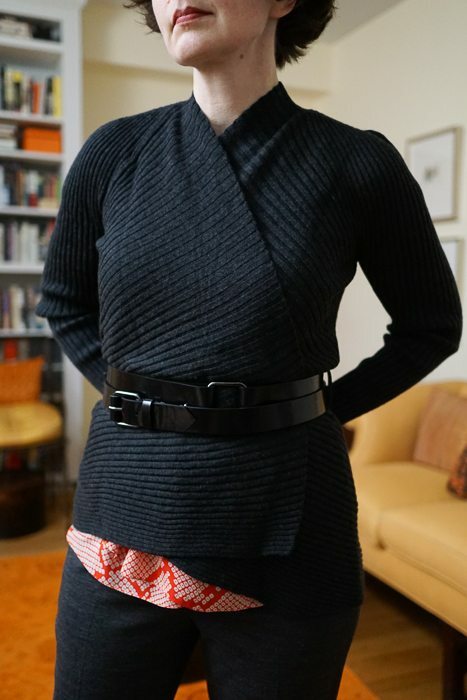 If you prefer (as I do) a more tailored look, a belt will provide additional structure to knits. For this purpose, I like a belt with some presence: wide, glossy calfskin (or patent leather) with some hardware (buckles, grommets, studs). 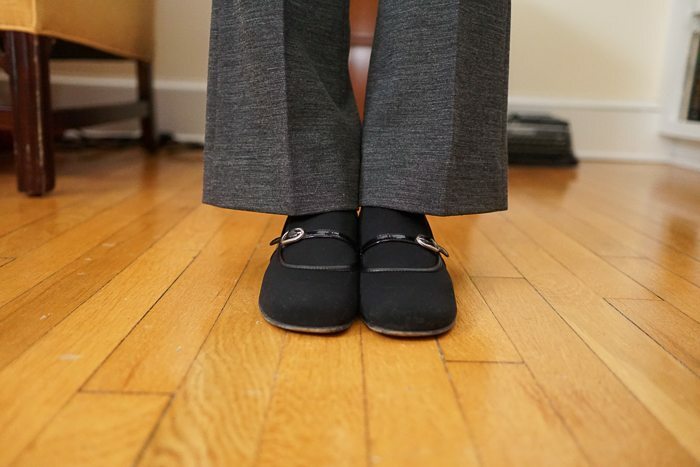 Using a belt to cinch the cardigan does make the ensemble less comfortable, but consider this: You can loosen the belt as the day goes on and if you’re sitting alone in your office with the door closed, you can take the belt off altogether. You may remember this belt from last summer? 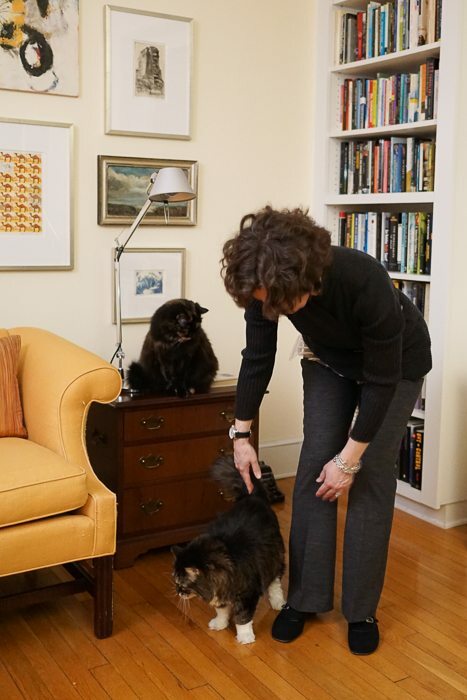 I am a big fan of Eileen Fisher knits, which are expensive, but well made and durable. I bought this open cardigan at least 10 years ago and it’s still beautiful. It has, however, grown asymmetrical — a change that I ascribe to home-laundering (I blame m’self) — but I like the asymmetry. The pants came from Ann Taylor. 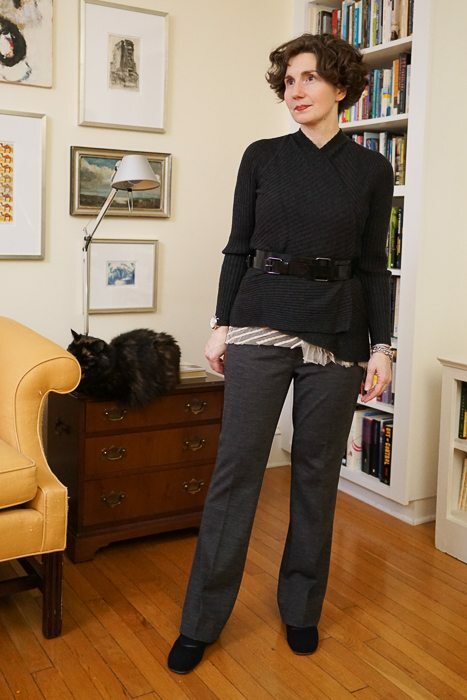 Whenever you find a pair of black or charcoal grey merino knit pants that hang well on your figure, you must buy them. Please just trust me on this. They will serve you like an insurance policy that pays on the feeblest of claims over and over again. In an attempt to vary the indoor background, the photographer and I have moved to the other side of the living room. Harper and Posy are keenly interested in this arrangement, and have come to investigate. Above I am wearing the knits with a red silk blouse, which you may remember from this earlier post. I also wear this sweater and pants with a top made of pink tulle. With both tops, only a little shows. For those of you who have requested more layer-by-layer shots, here is a fuller view of the tulle top and the cardigan unbelted. You look very smart as always, but I confess I am now equally interested in seeing the rest of your house. So stylish! Thank you, Roberta. If you want to see more of the apartment, you actually can. It was the subject of an Apartment Therapy house tour a few years ago. Here is the link: http://www.apartmenttherapy.com/victoria-house-tour-176509 . How fun is that! Thanks, Directrice, for sharing that link! You have a charming home. I believe I grew up right near you, and my family still lives in NW. People who work from home do so in something other than loungewear? And with actual shoes? At the (snowed-in) moment, I am doing neither. And as a professor who moves around a lot in class, I can’t help but notice that your “at home” work outfit bears a striking resemblance to my “at work” work outfits. Yes, I’m on Team Soft Pants. Sorry for the confusion — these are work clothes. I wear rags when I work at home. Ok — Exercise clothes is probably a better description. They are very soft. 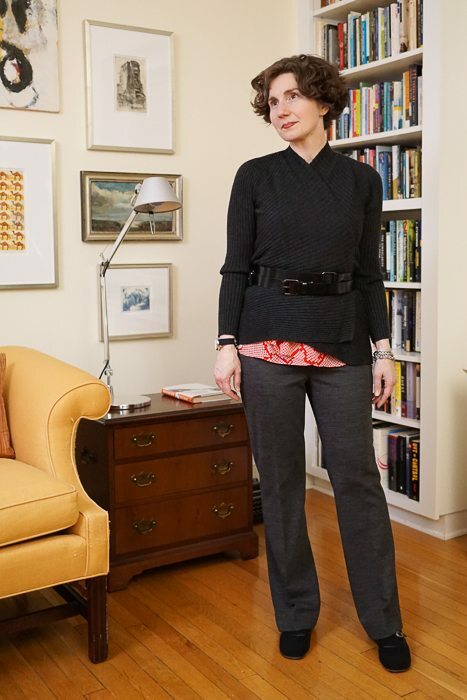 “for anybody who works at home and finds that the boundary between dressing for work and dressing for bed has become very blurry.” — why are you looking straight at me when you say that? 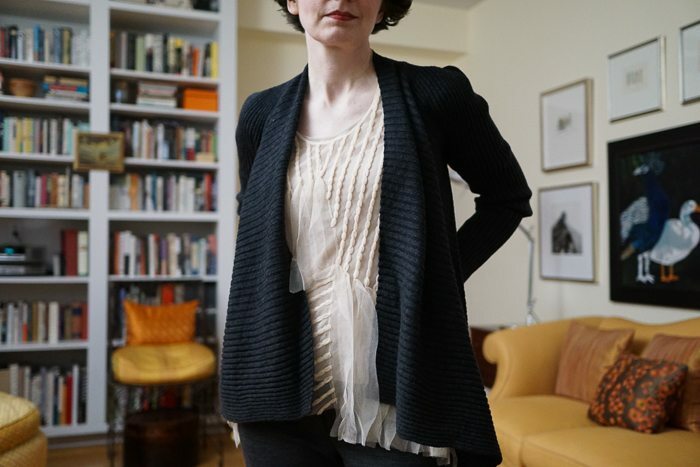 I think I like the tulle top even better with the cardigan open– the texture of the two play off each other so nicely. Charcoal and pale pink is a great color combination too, so rich and sophisticated and avoids the 80s associations that a lighter gray sometimes suggests. Ha! 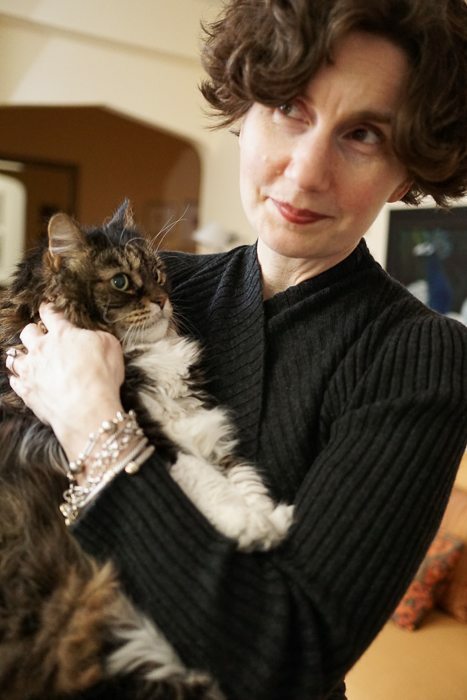 Not eyeballing anyone, but most keen to connect with the delightful freelancers who read this blog even though they are not office-bound like I am! The knit midi skirt is a terrific idea, too — A-line or column style — great with boots or a platform Mary Jane. 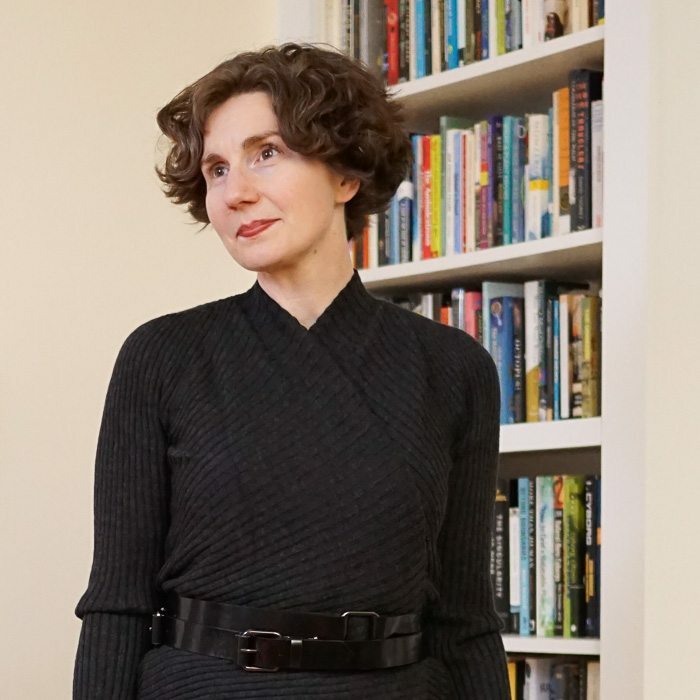 The other thing that is great about knit dressing is that it works very well for family occasions (like Thanksgiving and Christmas), when you want to dress up, yet be comfortable and not look like you might present a power-point between the roast and dessert. Thank you so much for the tour of your beautiful home! I loved what you said about choosing possessions and artwork with deliberation and care. It prompted me to look around my condo with a thoughtful eye. Thank you, Roberta — so nice of you to say so! For the record, I want to make sure that everyone knows that I only wrote the “survey” portion of the house tour. The generous introduction to the tour was written by an Apartment Therapy contributor, who opined that it takes courage to collect art. For my part, there is no courage in collecting — just appreciation and enthusiasm, and faith that the perfect place for a new piece can always be found. (For those who’ve see the documentary Herb & Dorothy, you may remember the line, “They were just greedy.”) Thanks again, Roberta, for visiting and commenting.